12 ¼ x 12 ¼ x 2 ½ in. Mosaics, decorative surfaces covered in small pieces of colored stone, marble, or glass, were popular in the ancient world on floors and walls. 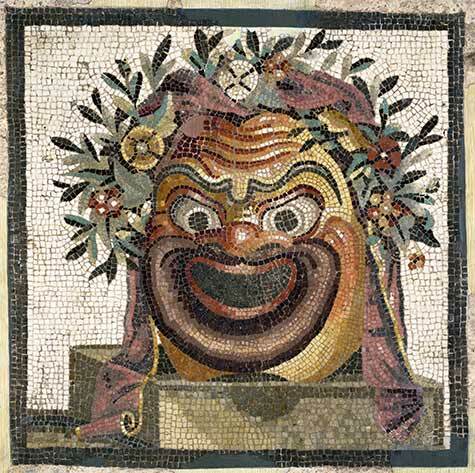 This small mosaic features a mask of Silenus, a companion to the Greek god of wine, Dionysus. Said to possess great wisdom, Silenus frequently serves as the comedic foil in Greek theatre, where masks were popular props. Silenus is recognizable by his snub nose, round face, and wide eyes.